Los Angeles Lakers forward Brandon Ingram thought his suspension for an altercation with the Houston Rockets might have been worse. Ingram will be off the court for four games because of his involvement in an incident that saw the 21-year-old and team-mate Rajon Rondo clash with the Rockets' Chris Paul on Saturday. 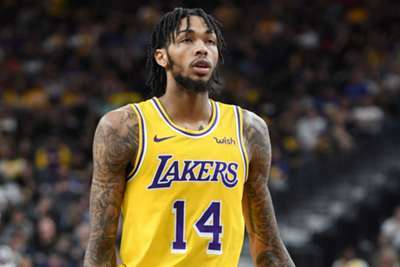 But Ingram, who has averaged 14 points and four rebounds through the first two games of the season, feared he would be given a greater punishment. "It was better than we expected," Ingram told reporters on Monday. "I'm happy it's only four but I know I have got to control my emotions a little better. "It's my full responsibility. I think I'm the one that caused action and I'm going to take full responsibility for every action that I did. "It was 100 per cent that I was wrong for my team-mates, but I also stepped up for my team-mates and that is what I'm going to do 10 times out of 10." Paul was suspended for two games, while Lakers guard Rajon Rondo received a three-game ban. Ingram and Rondo will begin serving their suspensions when Los Angeles face the San Antonio Spurs on Monday. Lakers coach Luke Walton said Lonzo Ball and Kyle Kuzma will start in their places.